"I want to spend my heaven in doing good on earth," said St. Therese of Lisieux, as noted in The Final Conversations. And so she has, with at least four Church-approved miracles involving physical healing attributed to her intercession, miracles that paved the way to sainthood for the beloved Carmelite nun. 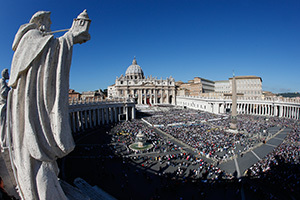 In October, seven more men and women will be added to the canon of saints: Pope Paul VI, Archbishop Oscar Romero, Father Francesco Spinelli, Father Vincenzo Romano, Mother Catherine Kasper, Nazaria Ignacia March Mesa and Nunzio Sulprizio. All have mirrored St. Therese's example of "doing good on earth" from their place in heaven. 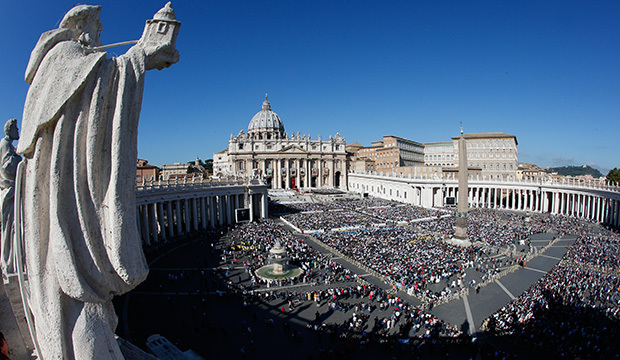 In the case of Pope Paul, both miracles attributed to his intercession involved the healing of unborn children amid complicated, life-threatening pregnancies — a poignant link to his papal encyclical Humanae Vitae, promulgated a half-century ago. But such intercession is about much more than seeking and receiving miraculous healing and joy in the face of earthly pain and despair. 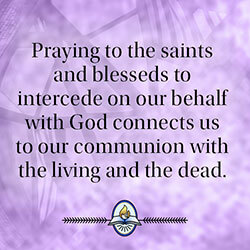 Praying to the saints and blesseds — or, for that matter, to anyone in heaven — to intercede on our behalf with God connects us to a core belief of our Catholic faith: our communion with the living and the dead. "We believe in the communion of all the faithful of Christ, those who are pilgrims on earth, the dead who are attaining their purification, and the blessed in heaven, all together forming one Church. And we believe that in this communion the merciful love of God and his saints is ever listening to our prayers" (No. 30). In other words, the saints who have gone before us listen to us. Such was the point made a few years prior to Solemni Hac Liturgia, when the Second Vatican Council addressed the value of and justification for intercessory prayer in Lumen Gentium, the Dogmatic Constitution on the Church. "For by reason of the fact that those in heaven are more closely united with Christ, they establish the whole Church more firmly in holiness," noted the constitution (No. 49). "They do not cease to intercede with the Father for us, showing forth the merits which they won on earth through the one mediator between God and man. ... Thus by their brotherly interest our weakness is greatly strengthened." "By this devotion to the exercise of fraternal charity, the union of the whole Church in the Spirit may be strengthened. Exactly as Christian communion among our fellow pilgrims brings us closer to Christ, so our communion with the saints joins us to Christ, from whom as from its fountain and head issues all grace, and the life of the people of God itself" (No. 957). Moreover, from its earliest days, the Church "has honored with great respect the memory of the dead," says the catechism. "Our prayer for them is capable not only of helping them, but also of making their intercession for us effective" (No. 958). It was St. Dominic, the catechism notes, who on his deathbed told his followers, "Do not weep, for I shall be more useful to you after my death and I shall help you then more effectively than during my life" (No. 956).